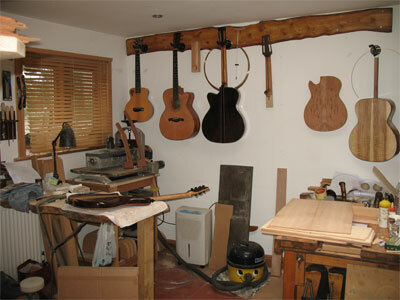 I am very lucky in that I have a purpose built workshop at the rear of my garden, it is very well equipped with tools and specialist luthier's jigs – most of them home made. The workshop is fully climate controlled and I like to keep the relative humidity at around 45%. I do all of the major guitar work in here apart from spraying which I tend to do outside when the weather is favourable. I have excellent lighting in the workshop for working during the darker hours, but during the daytime, there are two large roof lights in the ceiling which gives excellent daylight conditions. This contraption is called a 'Go Bar Deck' and placed at the bottom of the deck is a radius dish. 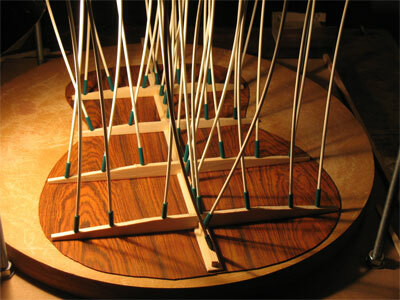 The top is bolted on using adjustable rods. The 'go bars' are made from fibre glass rod bought from a curtain making supplier and the rubber end caps are from a kite supplier. The dish is machined out to radius of 15 feet on one side and 25 feet on the other. 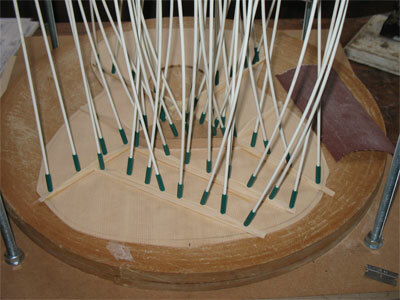 The 15' side is used for gluing braces onto the back of the guitar and the 25' used for the top. These radii give a slight doming to the top and back of the guitar, this is very important for the structural integrity of the instrument. 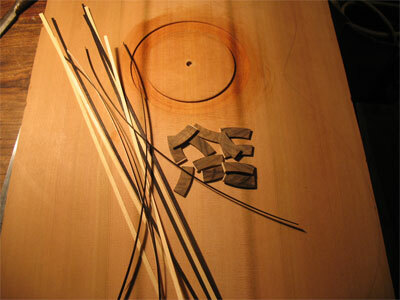 Here we have all the components ready to inlay into the soundboard to make a rosette. 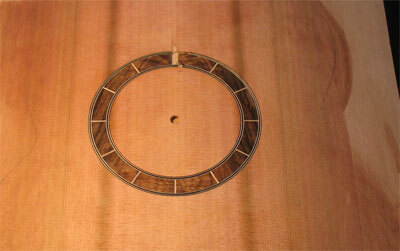 In this case I am using some burr walnut segments as the main inlay with maple and black purling lines. And here is the finished inlay – you may think there is a gap at the top of the inlay, but this gets covered by the fretboard. 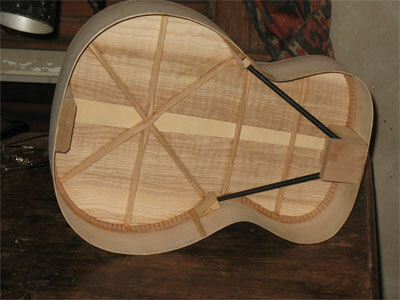 This is a 12 string guitar using X bracing for the back, the wood is rippled English ash. Carbon fibre flying buttress braces, complete the structure. This guitar has a more conventional back bracing and the back and side wood is quilted mahogany. You can see from these two pictures that I use carbon fibre flying buttress supports, I fit these to a lot of my guitars and the idea behind it is, that because of string tension (about 170lb), most acoustic steel string guitars will need a neck re-set after 20 – 25 years, the neck tends to pull upwards as the sound hole area collapses and you end up with a very high playing action. These bars resist that force and transfer it into the waist area and into the back of the guitar. Non of my acoustic guitars are 25 years old yet, but I am very confident that we should be able to double that time at least. 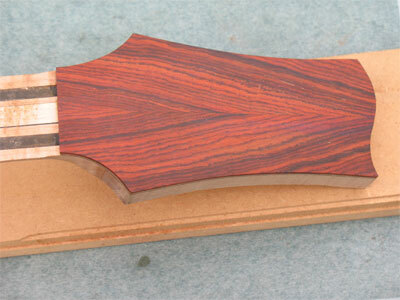 A book matched Mexican cocobolo headstock veneer, cocobolo is one of my favourite tonewoods. 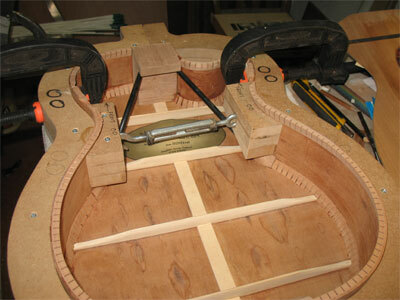 This headstock needs to be routed out for the purfling lines and the slots cut for the tuners. You can see the two carbon fibre re-enforcing bars that run down the entire length of the neck, these bars add greatly to the stiffness of the neck. A finished cocobolo bridge. Cocobolo is a true rosewood dalbergia retusa from mainly Mexico and Nicaragua. You can see the beautiful finish on this, it's a very dense wood and that's how it polishes up! © 2015 Bob Matthews Guitars.